Hey, nice mods. I'm having problems with this mod of the 'Near Future' mods. All of the others work but this one doesn't even show anything in the thruster category. (I looked everywhere else too) Am I missing a required mod? Is there another process I need to go through, besides putting it in GameData folder? Specifically the folders, do I need the files as well? Hey sorry I don't check these comments often. It is a very simple drag and drop, make sure the contents of the GameData in the zipfile go into the GameData in your directory. I downloaded the mod and put it in the Game Data folder, yet the items do not appear when I play the game. Can someone help me out? I've been messing with all of your Near Future packs and they have some wonderful new things to play with. 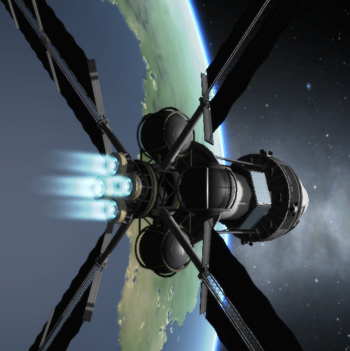 However, I've found that the new propulsion engines are quite useless to a seasoned KSP player, a few more KN of thrust power for over 4x the resources ( Maybe I'm just doing it wrong)? I like the idea of the new resources, and adjustable power levels. I really think you're on to something. I would love to see how far your Near Future mod pack goes. As I said I've been playing with it for a little while now, and the favorite of mine is a constant battle between the Near Future Spacecraft and the Electrical.But please keep working and I hope you take what I've said into consideration. Any prospect for an update for 1.0.0 or 1.0.2? I was just wondering, how did you change the fuel type to Liquid Hydrogen and Argon Gas. I tried changing the resource name in the cfg file from Liquid Fuel to Helium just to see if it worked and it loaded all fine but it just showed Oxidiser on the menu for the fuel tank. Generally if I include dlls, you should install them, or things will probably go wrong. Make sure to install things exactly as I give them to you - the "GameData" folder should be placed directly in the root KSP directory. If you don't do this, you'll almost certainly get errors. The tech tree addon also has to be installed in a very specific way, did you to exactly as instructed in the instructions? I am running 64 bits btw. Could you please tell me how to fix it. I would love to be able to use all these super efficient engines. *edit* I forgot, I didn't instal the 2 dll files in one of the packs. Do I need to? Where do I put these? I didn't add them cuz I don't know where. -They call me: "efficiency CrAzY"
I can't reproduce this on my install. Could you please PM me your output_log.txt? While i do feel that a few of these engines are surprisingly underpowered.. the fact that most of their efficiency combined with the longevity of even a small reactor means you get more bang for your buck.. (or in the context of Nuclear Pulse Engines.. "More bang-bang-bang-bang-bang-bang for your.." pff.. see what i did there?) makes this mod simply a MUST for long-term probes and those extra-CRAZY missions to Eeloo or Dres.